A large 3.5m diameter brick oven fan was the cause of both occupational and environmental noise problems (the latter involving the local Environmental Health Officer). 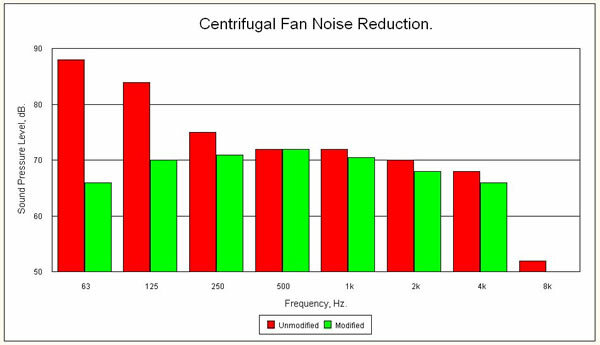 Occupational noise levels in the room next to the fan were dominated by low frequency tones giving an overall level of 90dB making the use of hearing protection mandatory. Tonal noise was also the cause of the environmental noise problem. Quotations for conventional treatments involved an enclosure, a requirement to move the fan to create space for a large silencer and a down-time of a few days. The overall cost would have been over £15000 and would have caused serious production difficulties as the fan is run 24 hours a day. Analysis of the noise showed that the low frequency tone was at the blade passing frequency of 62.5 Hz (468 rpm fan speed and 8 blades with a level of 112dB. The tone was radiated by the fan casing and ductwork and also propagated up the chimney into the local environment. 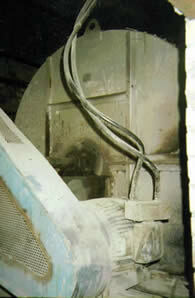 Source control techniques developed by the INVC were used to design retro-fit modifications for the fan that fitted inside the fan casing. These were fitted during scheduled down-time of a few hours and reduced the blade passing tone from 112dB down to 99dB and the noise level in the 63Hz octave band by 22dB (99% reduction) as shown below. The overall noise level was reduced from 90dB down to 79dB. This eliminated both noise problems quickly and effectively and at the same time reduced the overall cost from £15000 down to £1000. Moreover, no additional down-time was required to implement the modifications.